11. Sodium: What’s In Na? 3 Comments on 11. Sodium: What’s In Na? Turns out ancient sages and seers might’ve actually known a thing or two. Also, is there a good reason for sodium’s chemical symbol? Na. 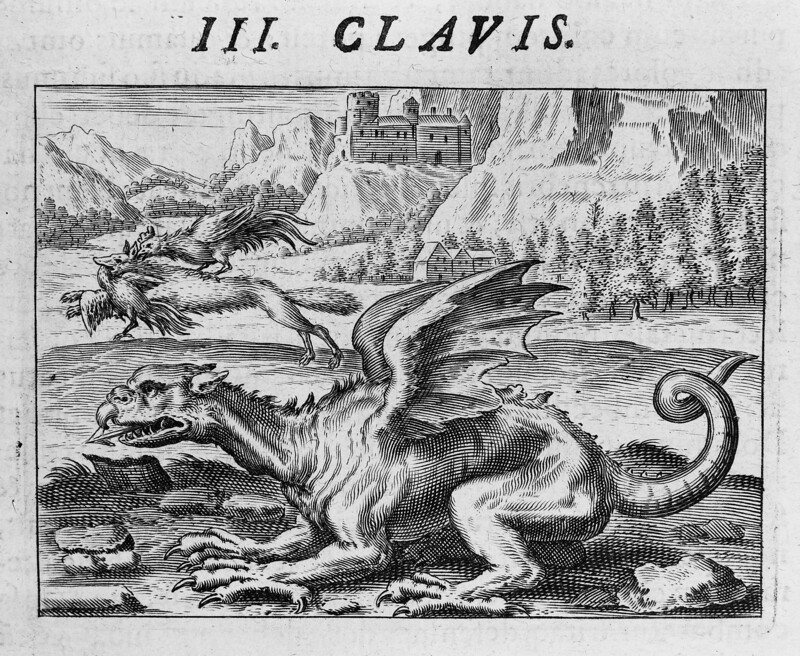 Featured Above: The Third Key of Basil Valentine, featuring the introduction of an eagle to an old dragon. It’s Not A Very Funny Blooper Reel: Around 16:20, I mention that Berzelius thought the existing system of chemical symbols was “needly” expensive. Apparently, I was so focused on the correct pronunciation of “Jons Jacob Berzelius” that I completely dropped a syllable from the plain old English word, “needlessly.” By the time I caught the error, I didn’t have time to re-record! My apologies. Someone else wrote in to explain how playing with sodium left him permanently blind in one eye. Maybe just stick with the sodium vapor lamp for your collection. RIP: One of the most notorious salt tax in history was the gabelle, a French tax that lasted for a few centuries. One of its enforcers was the previously mentioned Antoine Lavoisier, though the gabelle died around the same time he did — and for the same reasons, too. Many of the historical figures we call chemists saw themselves as alchemists. Science is a process! and it didn’t just start in the 17th century. Lab-Grown Diamonds Are Much Most Cost-Effective: It turns out that the transmutation of lead into gold is technically possible, using state-of-the-art technology. I don’t believe it’s ever actually been done, but in the 1980s, scientists carried out the (easier) transmutation of bismuth into gold. But just because it’s possible doesn’t make it wise: Considering all the work and energy that goes into the process, it wound up costing about a quadrillion dollars per ounce. Signs And Symbols: The above image shows off a small selection of alchemical symbols, as well as an example of chemical writing. Being written about a century after Valentinus’ work, it’s much closer in tone to what we could recognize as scientific language, but still a bit curious. Now That’s Teamwork: The substance created by Valentinus’ poetic process is called, appropriately, aqua regia, meaning “royal water.” Chemically speaking, it’s a 3:1 mixture of hydrochloric acid and nitric acid, and the way it breaks down gold is rather fascinating. Larry Principe And The Philosopher’s Tree: Larry Principe is a scientist who’s spent years digging into alchemical texts to see what the authors might have really been getting at. He found that one experiment, creating a tree of gold from a metal seed, was actually quite possible — although not quite what it sounds like at first. Chemical & Engineering News has the full story and some interesting photographs. The End: With apologies to the brilliant Tom Lehrer. Today we begin exploring the periodic table’s third period, and this is where it really starts to become clear that elements of the same group exhibit similar properties. For instance: Sodium, like its upstairs neighbor lithium, is a lightweight metal, soft enough to cut with a knife, and reacts violently with water. The main difference is that sodium’s interaction with water is more explosive. Theodore Gray, whose book we mentioned in episode one, was well aware of this fact, but displeased by a conspicuous lack of evidence on the early internet. Seeing a problem with an easy solution, Gray ordered three and a half pounds of metallic sodium off the internet and invited all his friends over for a sodium party. I should note that this is not an advisable action to take, as serious injury is highly likely. But since Theodore Gray is an expert, or at least an eccentric, and since no one got hurt, we’ll give him a pass. Gray produced substantial photographic evidence of sodium’s explosive qualities, learned why different amounts of sodium produce different kinds of explosions, and provided an entertaining evening for his friends while avoiding the watchful eye of the Environmental Protection Agency. Of course, like any good entertainer, Gray had rehearsed before the big day. He cut off a very small bit from his three-and-a-half pound slab and dropped it in a bucket of water. Sure enough, the stuff exploded with enough force to blow apart his steel bucket at the seams. Today, we’re positively charged about sodium. You can probably guess why sodium is so reactive: Like lithium and every other alkali metal, its valence shell is occupied by a single electron, and it desperately wants to ditch it. If elemental sodium were to come in contact with an element that’s seeking an electron, like fluorine, then they combine. But they combine in a way that differs from covalent bonding, like we’ve seen with O2 molecules. In that case, each oxygen atom naturally has six electrons in its valence shell and wants to fill it with two more. So oxygen atom A lends two of its electrons to oxygen atom B for a moment, then oxygen atom B gives them back and lends two of its electrons to oxygen atom A. It’s not perfect, but having a valence shell that’s full half the time is better than never being full at all. This arrangement keeps them bound to each other, because they keep passing electrons back and forth. But that’s not what’s happening with our sodium and fluorine atoms. Sodium doesn’t want to lend its spare electron part-time — it wants to ditch it for good. Similarly, fluorine has no interest in cordial part-time arrangements — it will beg, borrow, steal, or straight-up cut an atom to fill its valence shell with one more electron. So it sounds like sodium should happily donate its spare electron to the voracious fluorine atom, and then they should both move on with their lives. Why would they stick together? You might have already guessed it: When fluorine gains an electron, it has one more electron than it has protons, giving it a negative electrical charge. And when sodium loses an electron, it has one fewer electron than it has protons, giving it a net positive electrical charge. Both atoms have become ionized with opposite electrical charges, and just like Paula Abdul said, opposites attract. Sodium chloride is omnipresent on earth and throughout history. It’s practically impossible to stock a pantry that’s absent of salt, but that’s a very modern luxury. Before refrigeration, salt was the primary way people preserved food, since it prevents bacteria from growing, and subsequently, food from rotting. And it wasn’t always so easy to buy a fresh salt shaker from the market. Entire wars have been fought over access to salt, at least as long ago as 2700 BCE in China,3 and as recently as 1878 in Texas. One of the most famous acts of civil disobedience in world history was Mahatma Gandhi’s Salt March, in which over 60,000 Indians were jailed and many more were beaten by the occupying British for the crime of making their own salt. More places are named after salt than you might realize. There’s Salt Lake City, Utah, and Salt Fork, Ohio, of course, but it goes well beyond that. The Austrian city of Salzburg translates as “Salt Fortress,” and almost any town in England that ends in “-wich,” like Norwich and Sandwich, is a place where salt was harvested. There’s no single story about sodium chloride that sticks out above all the others, because all of human history is just a part of the history of salt. After all, other animals might not crave chocolate or coffee, but every animal needs sodium to live. Plants are quite low in sodium, so herbivorous animals need to seek out supplementary salt to stay healthy. Farmers provide their livestock with salt licks. Wild elephants in Kenya have used their tusks to literally mine salt from mountain caves, deepening them by hundreds of meters over the past several centuries. And in North America, hunters followed trails made by deer as they ran in pursuit of salt. Those trails often widened to paths and then roads, many of which are still on the map today. The unavoidable pervasiveness of sodium chloride in our history, our gastronomy, and our biology makes it a little surprising that table salt had nothing to do with the discovery of sodium. When we last met Humphry Davy, he had burned his eyeballs and fingernails while hunting for elemental fluorine. The reason tried something as crazy as running an electrical current through hydrofluoric acid was because that method had been very fruitful earlier in his career. He started by running a current through pure water — same as we did in episode one — and gradually got more complex. In 1807, he was performing electrolysis on salts — but not sodium chloride. He took a sample of sodium hydroxide, also known as lye or caustic soda, and heated it to 320 degrees Celsius. Thus melted, Davy immersed his platinum electrodes in that boiling-hot corrosive liquid and flipped the switch. A column of flame erupted at the negative anode, and globules of a never-before-seen metal sputtered forth. Since Davy isolated the new element from caustic soda, he named it sodium, and that’s why we still call it that today. But hold on. Something doesn’t add up here: sodium’s chemical symbol is Na, but there is no n and no a anywhere in its name. Every other element’s symbol has made sense so far: H for hydrogen, C for carbon, Ne for neon — so what gives? The story is a little more complicated than it seems at first glance. To get the whole picture, we’ll need to look a little further back in history. Alchemy gets a bad rap. The word often conjures images of would-be wizards trying to change lead into gold, but it’s really a very broad term describing philosophical and experimental endeavors from Africa to Asia to Europe across centuries. This can be a little confusing, especially reading it centuries after it was written. It sounds fantastical, almost biblical. For a long time, historians took works like this at face value, and decided the authors must have all been half-mad from mercury poisoning. Why so cryptic? Partly because the alchemists believed that their work was sacred, and had to be protected from those who might misuse or desecrate their findings. But they were also dealing with unknown, unnamed substances, and the systematic and taxonomic worldview we associate with modern science had literally not yet been invented. The alchemists were doing the best they could, and happened to share a cultural predilection for allegory and symbology. There’s nothing inherently wrong with that approach, except that by this time, the study of matter was no longer limited to handwritten tomes and hastily scrawled notes. Scientists were publishing their findings for the benefit of their colleagues and students in textbooks and periodicals, and most publishers didn’t have the type blocks required to print these esoteric symbols. This made publication more costly and time-consuming for chemistry texts than most other subjects. A Swedish chemist named Jons Jacob Berzelius saw this as a needlessly expensive and unsustainable system — especially as more and more elements came to be found — and he thought the solution was quite plain to see: Just use letters, the kind that typesetters already have lying around, to symbolize chemical elements. It was a simple, elegant, and future-proof solution. And he wasn’t proposing just any random letters to stand in. He took more than a bit of inspiration from fellow Swede and scientist, Carl Linnaeus, who had recently invented a standard method to assign every living thing a unique Latinized name — pretty much the same system we use to classify life on Earth today. In the class which I call metalloids, I shall employ the initial letter only, even when this letter is common to the metalloid and some metal. In the class of metals, I shall distinguish those that have the same initials with another metal, or a metalloid, by writing the first two letters of the word. He provided examples. Hydrogen was H; Carbon was C; Nickel was Ni; and Sodium was So. S… O. So… So why didn’t it stay that way? Well, around the same time, a German man named Ludwig Wilhelm Gilbert translated Humphry Davy’s work into his native tongue. But whenever Davy had used the word sodium, Gilbert simply replaced it with a term derived from the German word for caustic soda: Natronium. This name traced its roots back to a place called Wadi al-Natrun, where ancient Egyptians harvested sodium carbonate for use as a detergent. When the International Union of Pure and Applied Chemistry codified the names and symbols of the chemical elements, they sought to bridge this divide by splitting the difference, giving element 11 the name sodium and the symbol Na. But the feud continues: Sodium is still called natrium in several countries today. As far as sodium, it may have its roots in the Arabic word suda, which means headache, because sodium carbonate has been used as a mild painkiller since ancient times. That’s information that may come in handy after trying to make sense of this chemical character conundrum. The easiest and least imaginative way to add sodium to your collection would be, of course, to take some table salt out of your cupboard and place it alongside your other elements. But there are some other options. Much like neon, sodium vapor will emit light when an electrical current is applied. Unfortunately, it happens to be a color of light that’s pretty universally reviled. You might be familiar with it as the sickly orange glow of street lights. Even if you don’t have them in your hometown, those streetlights are all over Los Angeles — which means they tend to wind up in plenty of feature films. Or at least, they used to. In 2013, the city decided to replace its sodium vapor streetlights with the same technology that’s stifling the neon sign industry: LEDs. Brighter, more efficient, more pleasant, and less of a light pollutant, there’s little reason not to make the change. But our movies might lose a little something. For instance, director Michael Mann deliberately relocated the 2004 film Collateral from New York City to Los Angeles because of the unique colors of Los Angeles after dark. But surely for you, this is only good news, since it means the price of sodium vapor light bulbs is falling, and that much easier to acquire. The discerning collector will be pleased to learn that it is possible to isolate metallic sodium from household chemicals without running a deadly electrical current through boiling-hot lye. You will need to start with lye, but room temperature is fine. Burn it with magnesium in an airtight container, like a soup can covered with a brick, to create a sodium-magnesium oxide aggregate. You’ll want to put that in the blender for a few minutes until you have a coarse mixture. Then, pour in a good amount of dioxane. Oh! Right, first you’ll need to synthesize some dioxane, but that’s pretty easy. Just mix concentrated drain cleaner with antifreeze, then run a fractional distillation apparatus until you’re left with orange goo and a clear liquid. The clear liquid is your dioxane! Anyway, mix that with your sodium-magnesium oxide powder and stir quickly over heat. Globules of metallic sodium will start to form! Once the mixture is cool and dry, pick out the sodium bits, cover them in mineral oil with a few drops isopropyl alcohol, and heat until the sodium coalesces. Voila! You now have one homemade sphere of metallic sodium. The whole process should only take about six days. Keep your sample under mineral oil, or else it’ll degrade in contact with the air. By the way, lye and drain cleaner are extremely corrosive, antifreeze is poisonous, dioxane is carcinogenic, and sodium metal is, of course, highly explosive. Also, you’ll probably ruin your blender. But if it were easy, everyone would do it! Thanks for listening to the Episodic Table of Elements. To read how a modern-day scientist successfully followed an alchemist’s recipe to grow the Philosopher’s Tree from a seed of gold, visit episodic table dot com slash sodium. So each episode of the show, including those that have already aired, now has two permalinks. You can visit episodic table dot com slash sodium, or episodic table dot com slash n a, to read this episode’s show notes. There’s also an episode archive and a newly added index of topics discussed on the show, so please do check out episodic table dot com if you get a chance. This is T. R. Appleton, reminding you that the kids today don’t know squat about sodium. ScienceABC, What Is Aqua Regia? How Does It Dissolve Gold? Theodore Gray, Sodium Party. I’m not sure, but I think this web page was published around February 7, 2003, based on its availability on archive.org. Asia Times, A Brief History Of Chinese Salt, The World’s Oldest Monopoly. Johan Nylander, January 4, 2017. Kiwi Hellenist, Salt And Salary: Were Roman Soldiers Paid In Salt? Peter Gainsford, January 11, 2017. The Atlantic, Whales And Dolphins Can Taste Only Salt. Polly Mosendz, May 31, 2014. The fact that this was published in The Atlantic seems too perfect! The Boston Globe, Good As Gold: What Alchemists Got Right. Stephen Heuser, March 15, 2009. The Secrets Of Alchemy, p. 147-149. Lawrence Principe, 2013. Smithsonian Magazine, Alchemy May Not Have Been The Pseudoscience We All Thought It Was. Richard Coniff, February 2014. Royal Society Of Chemistry, Periodic Table Of Alchemy. Elementymology & Elements Multidict, Development Of The Chemical Symbols And The Periodic Table. Peter van der Krogt. Jons Jacob Berzelius, Essay On The Cause Of Chemical Proportions, And On Some Circumstances Relating to Them: Together With A Short And Easy Method Of Expressing Them. Annals Of Philosophy 2, p. 443-454, 1813. Elementymology & Elements Multidict, Natrium/Sodium. You ought to do an article about potassium chloride vs sodium chloride. Why the first can be an excellent alt substitute, but a lot of people can differentiate. they are close on the periodic table, andone is heavier, but I don’t get why one is healthy, why my wife can differentiate the tastes, but I cannot, etc. that would be a good read. I like that suggestion! I think I will include that as a topic of conversation for the episode on potassium. Thanks for reading the blog, and taking the time to comment!